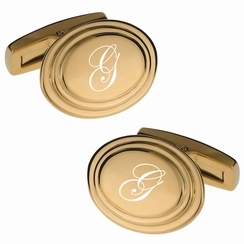 These gold cufflinks can be custom engraved with a name, date or monogrammed initials. Each personalized cufflink has an elegant beveled edge design that will add a sense of sophistication and class to any suit. They make great personalized wedding gifts for your best man or groomsman. All of our high quality cufflinks are precision laser engraved by our expert team of engravers. THERE ARE 3 WAYS TO PERSONALIZE YOUR CUFFLINKS When monogramming your cuff links please type in the initials in the exact order you want them to be engraved as we do not reformat the order once submitted!